FOUR invitations launched the new concert season with a bang, so I apologise to mezzo-soprano Sue Hutton and her accompanist Gill Hawkes, whose recital in Christchurch Methodist Church, Shepshed, coincided with operahouse's Opera Soundbites in All Saints, Loughborough, both raising money for charity. operahouse will not mind being labelled the usual suspects, I am sure. Clare Proctor, Lyndon Gardner, David Henshaw, Paul Blakemore, Andrew Lamb and Chris Shaw have appeared often in productions hereabouts, and only Naomi Wallacott was a new name to me. But pride of place in the programme notes went to thier accompanist Anthony Wilson, who played for all 24 items, from Mozart to Lloyd-Webber, using an upright piano in a cavernous acoustic. In a smooth running evening, Paul Blakemore was an engaging compere, complete with quiz. Churches invite a processional entrance. It always grabs the audience, though it's tricky for the accompanist. But aptly it was Do you hear the people sing? from Les Miserables, and indeed all the big ensembles worked well, especially the Donizetti and Mozart numbers. There were good trios from Cosi fan Tutti (Paul Blakemore, Clare Proctor and Chris Shaw) and from A Masked Ball (Clare Proctor, Lyndon Gardner and David Henshaw), which Charnwood Opera is doing in the church next month. Proctor and Gardner shone again in thier duet from Madam Butterfly, which operahouse presents in March. Clare Proctor's upper register and even tone were admirable, notably in her less than-evil Queen of the Night. David Henshaw was intimate rather than weighty in Mozart, while Andrew Lamb was best in quick passages. I Got Plenty O' Nuttin' suited him well. Among the men, only Lyndon Gardner appeared physically at ease, but he is a complete performer, and not just in a party piece like Largo al factotum. It was startling to hear his bravely soft singing in Gounod [A lève toi soleil], and his Lloyd-Webber Phantom's Song was the most satisfying number of the evening, touching as well as entertaining. And the finale? 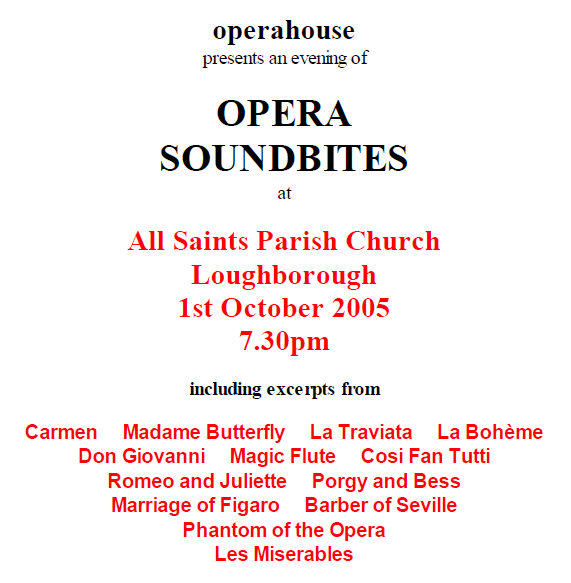 There were two actually, the septet from Act II of Figaro and lastly the Brindisi from La Traviata. 'Join in', they said, but the respectable citizens of Loughborough in the parish church were hardly Flashmob on Paddington Station.